Look Forword is considered an infection that you would probably do without. Rest assured you will not be happy to have this adware application on your computer. So, why not remove it? Our specialists at Pcthreat.com have concluded that this adware application is intrusive, and will most definitely jeopardize the overall health of your computer by displaying third-party ads. If you want to learn more about Look Forword and the reasons why you should delete it, please continue reading this article. Look Forword is advertised as a browser extension, which poses as a useful lyrics depository. 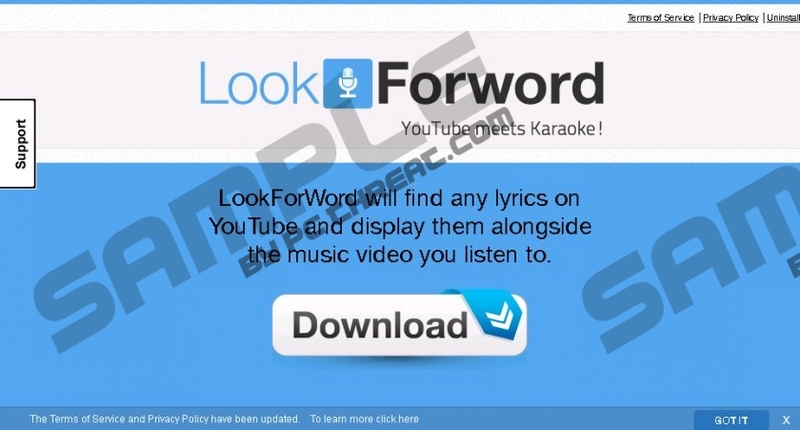 The website of the adware Lookforword.com claims that it will look for lyrics on YouTube and display them alongside the music video you listen to. Much to our disappointment the application does not work, which is a pity, because an application like this would be truly useful if it wasn’t fake. We are obliged to inform you that Look Forword is nothing more than an adware application that has been developed to irritate you with pop-ups, coupons, banners, in-text ads, and so on. As indicated in the terms of service, the developers of Look Forword offer no warranty and are not liable for any damages that might be caused by this application. The lack of liability is convenient due to the fact that Look Forword promotes ads that are provided by numerous shady third parties. Look Forword is known to display ads by Advertise.com, Dealply.com, Jollywallet.com, and Snappyimage.me, among other advertising platforms. It is no surprise that the developers of Look Forword do not take responsibility for what they promote and they do not check the legitimacy of the promoted content. Frankly, the developers do not care what they advertise as long as they get paid, which is a huge problem, because users might get infected with malware such as Trojans or ransomware. At any rate, users should remove this application as it is undoubtedly dangerous. In conclusion, we must highlight the fact that the application will not deliver on its promises. The application will not provide any lyrics for music videos, because it was not designed to do so. As mentioned, Look Forword displays commercial advertisements that are not checked for infections, which means that users may get infected with malware if this application is to continue residing on their systems. We urge you to remove Look Forword immediately, because there is no way of knowing what damage it could inflict. Locate Look Forword affiliated applications. Delete Look Forword affiliated extensions. Find Look Forword affiliated extensions. Remove Look Forword affiliated extensions. Quick & tested solution for Look Forword removal.